Put a bit of vrooom in your outdoor work. This new powerful all-round saw for people who value professional qualities in a saw. The X-Torq engine means lower fuel consumption and reduced emission levels. Auto return stop switch and visible fuel level makes the saw easier to handle. Equipped with Smart Start and fuel pump to every time ensure easy starts for nearly anyone. Centrifugal air cleaning system removes larger dust and debris particles before reaching the air filter. This results in reduced air filter cleanings and improved engine life. If you have to get under the "hood" that is no problem there too with a snap lock cylinder cover for accessing your spark plug. Only available for sale in the United States. Cylinder displacement: 50.2 cc Power Output: 3.2 hp Idling Speed: 2700 rpm Maximum RPM: 13,000 rpm Cylinder Bore: 1.73 inch Cylinder Stroke: 1.3 inch Ignition System: Walbro MB Ignition Module Air Gap: 0.01 " Spark Plug: NGK BPMR7A Electrode Gap: 0.02 " Carburetor Model Name: C1M/X5131 Fuel Tank Volume: 0.95 US pint Oil tank Volume: 0.55 US pint Oil Pump Type: Fixed flow Oil Pump Capacity: 9-9 ml/min Chain pitch & Gauge: .325" x .050 Drive Link Count: 80 Recommended Bar Lengths: 13"-20" Chain Speed at Max Power: 56.89 fts Weight without Bar & Chain: 11.33 lbs. 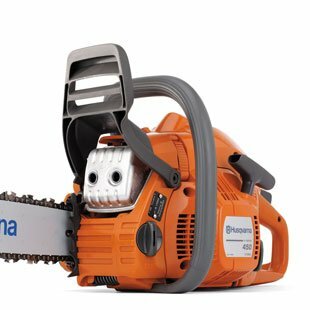 Husqvarna 450 20" 50.2cc Gas Powered 2 Cycle Chainsaw (Certified Refurbished) -- Free 1-3 Day Delivery With Hassle-free, 30-day Returns! 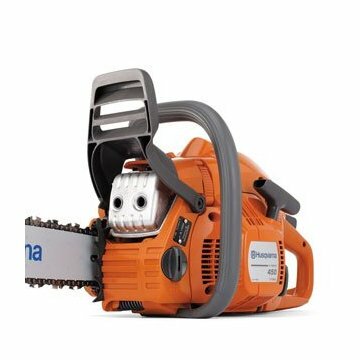 Store: vm express Condition: New (Open Box, or other) Price: $368.59 Total Price: $368.59 Buy It from vm express Husqvarna 450 Rancher 20 Inch 50.2cc Gas Powered X Torq Engine 2 Cycle Chainsaw -- Free 1-3 Day Delivery With Hassle-free, 30-day Returns! Last updated: April 20, 2019 at 23:37 EST. Pricing information is provided by the listed merchants. GoSale.com is not responsible for the accuracy of pricing information, product information or the images provided. Product prices and availability is subject to change. Any price and availability information displayed on amazon.com or other merchants at the time of purchase will apply to the purchase of the product. As always, be sure to visit the merchant's site to review and verify product information, price, and shipping costs. GoSale.com is not responsible for the content and opinions contained in customer submitted reviews.